One of the previews available on NPR Music this week is Youth Lagoon's sophomore album, Wondrous Bughouse, due March 5 worldwide via Fat Possum. While it may be easy to dismiss Youth Lagoon as another guy in a studio full of tricks, especially with the flattened-by-fuzz compositions found in the 2010's The Year of Hibernation, this collection of songs transcends that notion by embracing sonic structures and soaring melodic builds. 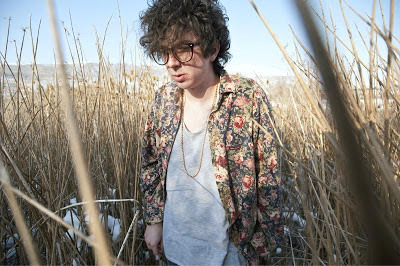 Trevor Powers is the wunderkind who uses Youth Lagoon as a stage name as well as an outlet for his wandering mind. The first album was based around the idea of psychological dysphoria, documenting the trails of his mind with songs of minimalism and hypnotic ambience. He described writing music as "my mind communicating with me, not the other way around... it can take me to scary places but I've realized those bizarre thoughts don't define me." Wondrous Bughouse focuses on the human psyche again, but this time it expands to include spiritual yearnings. Powers became intrigued with the metaphysical universe blending with pop music, and it shows. "A lot of this record was influenced by a fear of mortality but embracing it at the same time," he says. "Realizing that human life is only great because it is temporary... I'm not a gifted speaker, so explaining things is difficult for me. But music always makes sense." The first track, "Through Mind and Back" introduces Powers as the solo musician manipulating sounds for his own amusement. But then he launches into tuneful layers of instrumentation for "Mute" and allows a simple melody with vocals (doubled and yes, blurred) in "Attic Doctor." My favorite song is "Dropla," which is embedded at the bottom of this post and already picked for my next playlist. Its repeating chorus of "You'll never die," is at once hopeless and optimistic. There's a grandeur in "Third Dystopia" and a majestic simplicity in "Raspberry Cane" before "Daisyphobia" brings on a next generation St. Pepper approach for the end, leaving the listener instantly ready for another visit. Link to listen here and check out the tour dates below.